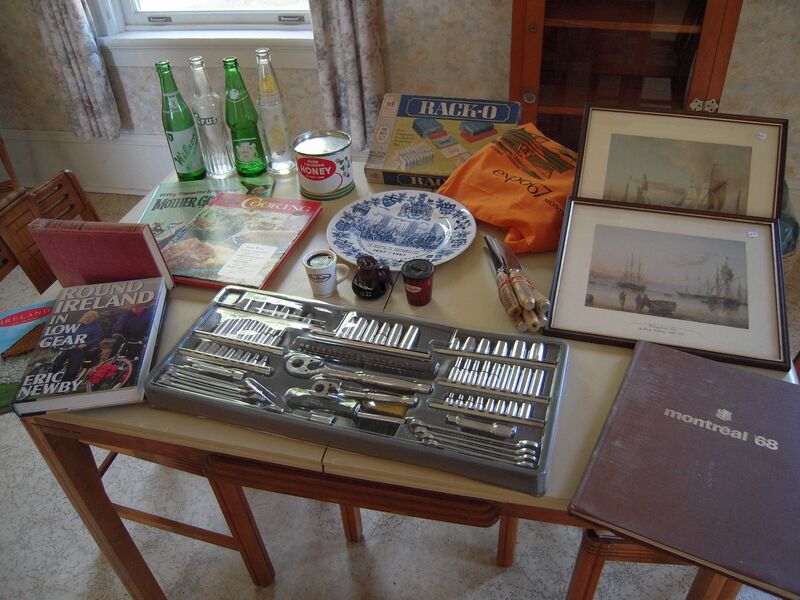 Some – but not all – of our finds from the slew of yard sales that we came upon in Madoc last Saturday. Is there anything more fun than finding a treasure at a yard sale and getting it for a dime or a quarter? By the time most readers read this, it will be Saturday. And really, what are Saturdays all about? I think you know the answer: yard sales. Last Saturday, the village of Madoc was absolutely abuzz with yard sales (and an auction sale or two, and an estate sale). It was probably a combination of it being a long weekend and the town being full of visitors thanks to the Madoc Motocross event, something that comes to town three or four times a year and fills the fairgrounds with the trucks and trailers of participants and spectators. It’s not my cup of tea, but I am reliably informed that revenues from the Motocross have been very helpful in keeping up the fairgrounds, and that that in turn helps the venerable Madoc Fair (coming up next weekend, and Raymond and I hope to be there!). So if it brings in people and revenue, who’s to complain? A couple of nice marine-themed framed prints. Yet another addition to my growing collection of Cherry Ames novels for would-be “career gals” of the 1940s and ’50s (Cherry being a nurse and occasional sleuth; but weren’t they all occasional sleuths?). An Expo 67 apron (which brings my Manse apron collection – you might recall it started with the gift of a fantastic turquoise one made by our friend Margaret – to two). A china display plate commemorating centennial year by reproducing the famous painting of the Fathers of Confederation in Charlottetown. Some minature Tim Horton’s coffee pots and cups, Christmas-tree ornaments. An early-’60s Mother Goose nursery-rhyme book and a 1972 Family Circle cookbook (I am a sucker for mid-century cookbooks, especially the ones with colour photographs of the “delicious” dishes that often feature Jell-O and pineapple rings and whatnot – and this one is particularly sweet because a previous owner has written favourite recipes and their page numbers inside the front cover, and by gum I am going to try them no matter how weird they might be). A great set of half a dozen bone-handled (and sharp!) steak knives. A tin that once housed buckwheat honey, a substance that is the basis of a funny story in Sedgwick family lore. A couple of vintage travel books (another thing I am a sucker for) about Ireland. And perhaps the best of all, a brand-new set of socket wrenches, which have already been put to use by Raymond on his truck. And the photo doesn’t even show the dozen or so vinyl records we turned up, including (be still my beating heart) some classic K-Tel collections! And one or two other things that might become the subject of future posts. All in all, an excellent haul for not very much money. And more than that, a whole lot of fun. This entry was posted in Uncategorized and tagged Bill Bantey, Canada Dry, Cherry Ames, Expo 67, Family Circle cookbook, Fathers of Confederation, Ireland, Jean Drapeau, Jell-O, K-Tel, K-Tel records, Madoc, Madoc Fair, Madoc Motocross, Mother Goose, Orange Crush, Rack-O, Raymond, Raymond's truck, Tab, Tim Horton's, Wilson's Ginger Ale, yard sales by Katherine Sedgwick. Bookmark the permalink. Hey, we have the same cool Confederation plate! Jonah pounced on it at a yard sale here earlier this summer–I think we paid a dollar. And he found a display stand for it at another sale last weekend, so now it sits proudly on the buffet (sideboard?). Only ours looks even more vintagey because it’s in brown tones. I am very pleased to hear that Jonah has discovered the joy of finding great stuff at yard sales! He and I must compare notes at Thanksgiving! Remember that the first step to getting help is admitting you have a problem. Just know that we’re all here to help. Anytime. John, Melanie should you contact Lorna? We shouldn’t let this spread to piles of cardboard on the front lawn before we stage an intervention. Ah, you’re just jealous about the great deal we got on the socket wrenches. Or maybe it’s the K-Tel records! On the plus side, the washing machine is still in the kitchen, so there’s a bit of piling space available. Maybe actually shoehorn a bunch of stuff INTO said worsher. Possibly that game of Rack-O? Yes indeed, the washing machine is still in the kitchen. But if you only knew how much more complicated than you might think it will be to move it out of there! The Manse has, in our brother John’s words, the least plumbing of any house he’s ever seen. Translation: there isn’t anywhere else to hook up that worsher until and unless we get a plumber in. And when we get a plumber in, we want it to be to do a much larger job, which is to add plumbing wherever we need or want it in the house. Which means we need a plan. And a lot of renovation money. And a lot of other renovation decisions made. And – well, you can see how it’s just so much easier to just forget the whole thing and go out visiting the Madoc yard sales. You won’t believe this but i almost bought a Rack-o game the last time i was out yard sale-ing! But I thought…who would play with me? Now I know! Who has more fun than we do??? I think we will have to bring our Rack-O game to Goose Rocks Beach next summer!